I took this series of photos on January 26, 2007, my father's first birthday after his death in 2006. He first took me up the Table Rocks when I was five years old, and this walk was to honor him. 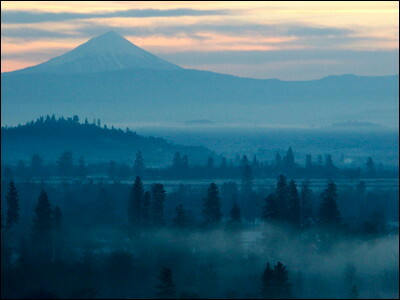 The first six photos are views of Mount McLoughlin and a foggy Rogue Valley as seen from the trail that winds up the rock. The remainder of the photos were taken on top of the rock and include shots of frozen vernal pools, a grove of madrones and nearby Lower Table Rock. In Takelma mythology, Upper Table Rock in southwest Oregon is the older -- and wiser! -- of the two Dragonfly Brothers (Elder Daldal and Younger Daldal) who traveled up the Rogue River, changing things and making the world ready for the arrival of human people. At the end of their journey they turned into the two Table Rocks which became the Ribs of the Animal that is the Takelma world, the center of the universe.